Matthew Shevlin celebrate at the final whistle after County Antrim's 2-0 win over Real Sociedad took them into the Premier Final.' Picture: Press Eye. Matthew Shevlin’s Dale Farm Milk Cup fairytale continued tonight as he fired County Antrim into tomorrow night’s final. 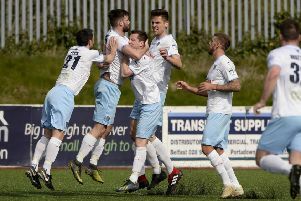 The Ballymena United striker came on as substitute to score both goals as Andy Hunter’s side beat Spaniards Real Sociedad 2-0 in the semi-final, at Ballymoney’s Riada Stadium. Shevlin, who also scored twice in Antrim’s final group game yesterday, stepped off the bench in the second half with the game scoreless. He quickly shot Antrim ahead with a side-footed effort from 10 yards following good build-up play. And Shevlin then secured Antrim’s place in the final - the same panel reached the Junior section final two years ago - when he raced onto a ball over the top, outpaced a defender and slotted home. But there won’t be an historic final ‘double’ for Antrim as their Junior team lost 2-0 to Ghanaians Right to Dream in their semi-final at Portstewart. The Africans will play Southampton in the junior final (6pm) after the Saints beat Liverpool 3-1 in their semi-final.